If you were strolling around Gaasperplas on Sundays last summer, you might have noticed her. A petite, soft-spoken Japanese girl, with two long black braids and a welcoming smile. You might have seen her standing in the grass, concentrating on the sound of a few Surinamese singing birds, trying to imitate the subtle notes with her own voice. 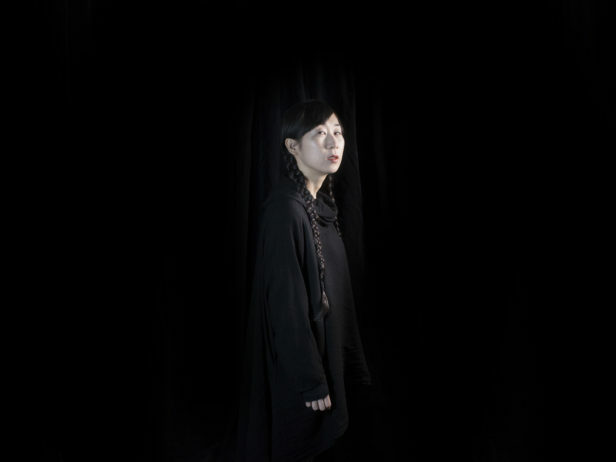 Miyuki Inoue is a voice artist, and uses the human voice as a tool in her diverse art work. She’s one of just a few artists participating in the temporary Master of Voice programme at the Sandberg Institute, and with her thesis project wants to find a way to help us unlearn everything we know about our voices. A Master of Voice, doesn’t that sound more like something for the conservatory, and not an art school? No, because voice art isn’t quite like making music, and it’s definitely not the same as singing. Everyone who studies here has a different background – there’s visual artists, performers, musicians – and everyone has a shared interest in using the voice. During the programme, we study what the voice can be, and what it means in a historical or political context. We experiment with voice, use it as a tool to make art, just like you would use a brush or a camera. What area of voice are you focussing on for your thesis project? I’m interested in the amplification of voice, and the imitation or modification of a human voice. I see this imitation as a way to expand your voice, freeing your voice, so to speak. The project will be about finding ways to do so. I collected these shapes, like horns and pipes, to use as a tool to alter or amplify the voice. Other tools can be found in the architecture or space itself, like a hole in the wall or a box you can speak in to, or a cave under a highway, or even a PA system. It would be really nice if I could use a large megaphone speaker, the kind the government uses! When I was growing up in Japan in the countryside, every house and town had a speaker. Around 7 o’clock in the morning, a song would play on the speaker to wake you up, and again at 12 o’clock and at 5 o’clock. Quite handy if you’re working in the field or playing outside, you always knew exactly what time it was. I don’t think they use these anymore. When you talk about freeing the voice, are you talking about your own voice or the voices of your audience as well? I haven’t had a chance to do a voice installation yet, but if I do get the chance I would definitely want people to participate. I’d like to help people explore their own voices, listen to each other, and experiment with their vocal range. It’s really nice to hear other people’s voices, it can be a very intimate experience. Some people might be too shy, but it’s liberating to get over that shyness. Experimenting with your voice is like unlearning how we use it. When we grow up, we learn these social habits; how we should talk, how we shouldn’t cry like a child anymore. But wouldn’t it be nice if you could still cry like a baby? Just have a big, loud cry with all that energy, fill up a space with your voice. We never do that anymore, because we learned how to speak and how to properly make a sound, based on gender and background and context. I teach a workshop where we try to unlearn these habits and go back to a child state, where we can use our voices any way we want and just breathe and relax. How did your art practice develop into the voice work you do now? I studied in Japan first, at a more general contemporary art school. I tried lots of different techniques and materials to express my ideas, which developed into performative installations. I liked the idea of using repetitive movements and materials in a space to tell a story. And on the side, I also liked to sing. I sing with my surroundings, with what I hear, and was fascinated with the connection between the voice and the space I was in. You can sing outside, make echoes, repeat different sounds. I made some experimental installations where I would ask people to say a vowel in a corridor or a staircase, really looking for a way to combine my voice practice with these performative installations. When I came across this master’s programme, it was a perfect fit. How long have you lived at WOW? Just a few months! I had heard about WOW via Facebook, and saw them at a ‘job fair’ at the Rietveld Academy in May last year. When I had to leave my old house, I thought well, wow, there’s WOW. I really enjoy living here, it’s nice to be surrounded by artists. We only meet each other in the kitchen and the hallway, so it would be nice to have a shared space where we can read or work together. Or where we can do workshops and teach each other our crafts. Can you tell us a bit about the projects you’re working on outside of school? Last November I worked on a project with Maria Lepistö and Alina Ozerova, which we exhibited during Museumnacht at CBK Zuidoost and Lost & Found at the Waag Society. It was a performance based on our research about Ringmaster, a Surinamese singing birds community. There is this bird in Suriname that sings really beautifully, but it doesn’t exist in the Netherlands, so they brought the birds and now they’re breeding them, and compete with other singing birds. We visited them at Gaasperplas every Sunday, and made a documentary and a short performance out of it, where I imitate the sound of the birds. It’s still a work in progress, and we’re still developing it, but it was nice to show the process during those performances. Do you think you’ll want to stay in Amsterdam when you’re finished school? Well, I need to graduate first! Almost everything I do now is focused on completing the thesis project. It would be nice to stay, now that I know some people who also do things with voice, and in Amsterdam there are quite a lot of improvisational performances and movements. If I want to do more vocal experiments, it would be easier to do here than in Japan. But I need a visa, of course, and an income, and I do miss the mountains! In Kyoto it is so easy to go to the rivers and the mountains. In the long term, I definitely want to be closer to nature. But let’s focus on graduating first! When we grow up, we learn these social habits; how we should talk, how we shouldn’t cry like a child anymore. But wouldn’t it be nice if you could still cry like a baby?